As a casual game historian, I can consider what Atari was trying to do versus what they were able to achieve, pat the game on the back, and congratulate it on giving it The Old College Try. And as obsessed as I was with 3D and virtual reality around the time of this game’s release, I surely would have been beside myself with glee at navigating polygon worlds. However, we’re reviewing games here, and from any perspective, this is more a tech demo than an actual game. Club Drive can be quickly summarized as a loose driving simulator in 3D worlds of shaded polygons. You have four creative stages to tackle in the race mode. Two tracks are somewhat realistic approaches to San Francisco and an Old West town. The other two are fantasy levels that place you in an outdoor stunt track or inside a toy car speeding around a ground-level view of a house. 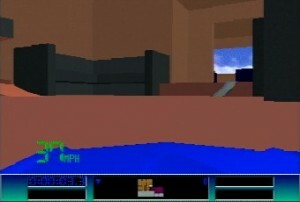 Up to two players can spin around the rooms, leap off towering furniture, and even weave between the legs of a polygon cat chasing a little mouse. I have no complaints about the variety and imagination of these zones, and the house level is especially cool and inventive. Driving through a house in first person. Neat idea, poor execution. The trouble lies with the execution. Club Drive’s ideas are bigger than the code can support. 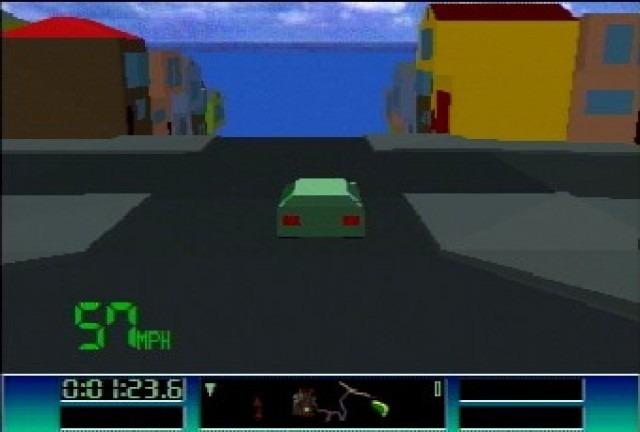 Previous attempts like Hard Drivin’, were pretty simple track simulations with the illusion of 3D, flat terrain, and occasional polygonal stunt structures. These games worked because the load was minimal, allowing for a clear sense of speed. Club Drive’s designers appear too eager to take the next jump into fully-3D worlds, resulting in a clunky engine severely limited in detail. Cars skate around the tracks more so that actually responding to the road, and frequently wobble around on all surfaces as they try to orient themselves – to the point that the top number keys all perform the same “manual stabilization” function. Cars turn sluggishly, yet also seem unaffected by gravity – you can easily drive up the side of a cliff like Lupin the Third’s Volkswagen. Your speed is also noticeably capped. The stunt track level is the simplest in layout, and not surprisingly, the only one you can floor it to 80+ MPH on. Every other track limits you to a paltry 54 MPH; hardly the kind of blazing speeds you’d expect out of a racing game. It makes a little sense for the cramped house, but even the Golden Gate Bridge rolls by at a lazy pace, mostly ruining any sense of reckless driving or thrilling speed. These levels are the content for the “race” mode, though there are no traditional AI cars to challenge you. The goal instead is to beat your own time, or to challenge a friend in split-screen two player (which places larger demands on the hardware and becomes more choppy and less enjoyable). Or, you could elect to simply drive around the various levels and take in the sights. Your car is indestructible and you can find small hidden zones off the standard paths; both of which encourage exploration. Should you travel off a cliff or get trapped in the terrain, you can hold down the Option key and rewind your run in real-time. You can wind back to before your mistake, release Option, and seamlessly pick the game up from that point. You can even rewind all the way back to the start of the track, if you wish, and pick your control up at any point in time along the way. Very cool. Unfortunately, creating your own merriment inside these levels won’t last too long. Every zone, except the house, is laid out like a standard race track. There’s a start, finish, and course boundaries that automatically engage the rewind system if you pass them. This means your exploration is quite restricted. You can launch yourself freely around about seven blocks of San Fran, and zip around the non-linear house, but there aren’t many ways you can take a canyon, coastal road, or the entire stunt track. It’s great that the game doesn’t limit you from just exploring the levels, but it quickly becomes clear that they aren’t designed for this. A freeroaming lack of purpose can get you through a couple plays, or maybe thirty minutes with a buddy just figuring out what you’re able to do, but the return diminishes significantly after that. This is especially true when you consider that the engine doesn’t make the existing driving all that exciting to begin with, and without other cars to race, the race mode doesn’t offer a true challenge on its own. If racing/casual driving isn’t your interest, you can play “tag” with a second player in split-screen, or engage in a “collect” mode. You drive your car around a trackless area, picking up power spheres that act somewhat like checkpoints for impromptu laps. You truly can tackle them from any direction, and you’re rewarded with a high score for figuring out the fastest and most efficient path to catch all the spheres. Some levels have holes in the wall to help you quickly teleport and come out on the other end of the map (think Pac-Man). However, these collect mode levels are astoundingly small arena-style cuts of the main tracks. It will take you a little less than four seconds to drive from one end of a map to the other, making it hard to hide spheres or your opponent. Or, to look at it another way, the “San Francisco” collect/tag level actually means “One enclosed, two-level parking garage in San Francisco.” The house map consists only of one large room and a connected kitchen and bathroom. The Old West map is just one main street with a row of six buildings on either side. You don’t get the freedom to play in the larger zones. I think having the collect mode take place in the full map would actually do wonders to justify the existence of both. But then, aside from a few possible winding detours, such a mode really wouldn’t be much different than the solo race system that already exists. I could go on, but let’s be honest, very few people are actually going to play Club Drive anyway. It requires a Jaguar console, which only a handful of modern gamers are going to purchase, and its clearly been defined well before this review as a title not worth getting. The snippier of reviewers (those that like to make you believe games like this are entirely without merit) are missing out on some of the worthy aspects, like the creative levels and the rewind feature. Unfortunately, their final scores are still correct. There’s no longevity to this game; there wasn’t even when it was released. If you still enjoy playing it, then it’s for other reasons (like nostalgia) that can’t be attributed to the code on the cart. There’s just not enough to do. Cheery graphics that look neat in stills. Tries a different path than the average racing game. Many inspired track ideas. Weak driving engine. Capped speed. Larger levels are too limited to truly explore, while smaller, non-linear levels are too tiny to enjoy. No AI racers, choppy two-player split screen; little to keep a player engaged. First, I love that you’re keeping the Jaguar going with a new generation! It does have a certain Micro Machines quality to it that I thought was refreshing. This is why I intentionally don’t trash games – it’s too easy to get jaded in this hobby. If someone’s having fun with a game, well, hard to find fault with that. True that J man! I stop reading reviewers who are basicly just trying to top each other with their outlandish “funny” negativity. Defeats the purpose of a review.